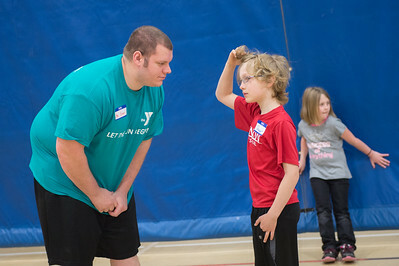 Spring break was a time for brushing up on lessons in measuring angles and mass and inspiring young minds from the Vigo County School Corp. to live healthier lives at the YMCA Spring Break Camp. 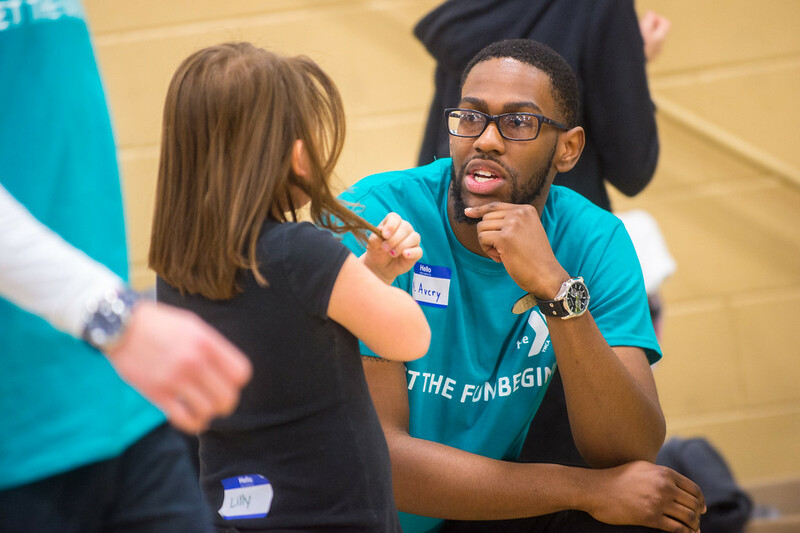 Co-hosted by Indiana State University - Nonprofit Leadership Alliance Certification Program and YMCAs of the Wabash Valley - Vigo County Branch, the spring break day camp at the YMCA saw participation from 50 children, ages 4-14. During first semester of the Experience Management Cycle course, around 35 Indiana State students started program evaluation planning, logic modeling, program budgeting and promotion and in December and January worked on activity leadership and program planning so the program could be conducted and data collection could begin, March 28-April 1. No amount of textbook material beats the opportunity for hands-on experience like Indiana State's students got from helping host the spring break camp, said Cameron Diekhoff, a junior recreation management and youth leadership major from Terre Haute. "We've been working the whole school year to put this camp on and I think it's gone really well," Diekhoff said. "It's a lot harder to work with kids than you might think, but it's also a lot of fun and I think everybody is learning a lot from this experience." Students reconstructed the recreation experience management cycle for YMCAs of the Wabash Valley, focusing on the organization's human and community development mission and the desired psychological outcomes of the participants, looking at the planning, implementation, evaluation, marketing and resource development stages of the cycle. The course is a requirement for students obtaining a Bachelor of Science degree in recreation and sport management with one of three concentrations in nonprofit leadership, recreation management youth leadership, or recreation therapy, or for students who are getting a minor in nonprofit leadership. The students' service engagement experience was created and facilitated by their co-instructors Nathan Schaumleffel, associate professor of kinesiology, recreation, and sport and campus/executive director of the Nonprofit Leadership Alliance Certification Program, and Steve Smidley, assistant professor of kinesiology, recreation, and sport and director of the Center for Recreation Management at Indiana State. Schaumleffel created this mutually-beneficial strategic partnership based on his book Cooperate: Advancing Your Nonprofit Organization's Mission Through College and Community Partnerships: A Guide for Nonprofit Leaders. Indiana State recreation and sport management students, and Nonprofit Leadership Alliance students, helped host the camp 8-11 a.m. Monday through Friday, plus a family night on Friday, with many of the students volunteering their time outside of time required for their class. Students designed activities, like tic-tac-toe relays, and followed up each day with a debriefing session, where the group discussed and evaluated the day based on the learning outcomes of the course. "Ultimately, we want our students to leave this project with the ability to simultaneously maintain physical and emotional safety, enhance leisure, client, and caregiver/parent satisfaction, and make measurable, impactful progress on improving STEM- and health-related outcomes," Schaumleffel said. The camp offered John Steward, a junior recreation and sport management major from Terre Haute, the chance to see the impact he can make in on young people. "It reassured my motivation for why I'm choosing to work with youth as my profession because I love seeing the youth experience ‘fun' in healthy, educating, and safe settings. Plus, I know if I was still a youth of their age, I would've loved to spend a week with college students who took the time to work so diligently to lead an outcome based program," Steward said. "Though the games and interactions were fun, I'm thankful that this day camp was so much more than fun. It was a life experience that has a positive impact on both myself and the participants." The students will spend the rest of the semester analyzing, reporting, visualizing, and presenting the program evaluation data to the YMCA, and other internal and external stakeholders. The students plan to present their program evaluation findings to the YMCA in April. "The YMCA and ISU are both big into service for the community, so this is a great partnership," said Eleanor Ramseier, branch executive of the Vigo County YMCA. "Being able to sponsor the spring break camp with Indiana State helps to elevate the quality of the program and lets parents know that their kids are getting a good academic experience while they're here." The camp was also an opportunity for Indiana State students to shine before a possible employer or internship supervisor. During the camp, based on performance, Schaumleffel and Smidley's students were offered internships and paid summer positions related to their major and career goals. One student was hired on the spot to work the rest of Spring Break Camp. "These kids learn a lot in their classes, but they don't really know what it's like until they're in a setting like this where they're asked to put their classroom lessons to practice with real kids. I hope this is an experience that they will look back on and say that they can do this," Ramseier said. 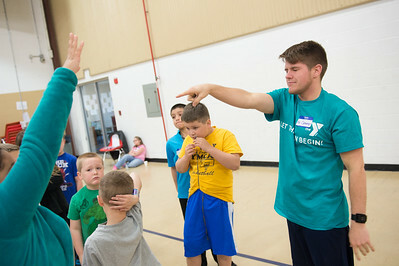 "I really love seeing how the YMCA, ISU and the Vigo County schools were able to collaborate and host this camp for the benefit of the kids so that they have a healthy place to go over spring break." There was a lot for the students to learn from through hands-on experience like this, said Jessica Wireman, youth coordinator for the YMCAs of the Wabash Valley. "Working with kids is sometimes unpredictable, so the ISU students are getting firsthand experience at what it's like when things don't always go as you planned," she said. "This is the first time that the YMCA has hosted this camp, so I'm impressed by how many children we have participating." Since August, the students have been preparing for the camp by reinforcing the Boy Scouts of America Youth Protection Standards, Child Abuse Prevention Guidelines, maintaining the proper adult to participant ratios for supervision as recommended by the American Camp Association, complying with YMCA policies and integrating age-appropriate activities and communication styles. "Many of these students will wind up being program directors at Y's, Boys and Girls Clubs, youth sports, parks and recreation departments, afterschool programs and summer camps," Schaumleffel said. "Right now, they're learning how to be program leaders who can lead with intentionality to program outcomes and an organizational mission, which is critical to their developments and aspirations to be program coordinators, volunteer manager, and executive directors of recreation and nonprofit organizations." Indiana State students help host YMCA Spring Break Camp, March 28-April 1, for 50 children, ages 4-14.